The outcome of the Spanish-American War had far-reaching consequences for several of Spain's former colonies. The United States annexed Puerto Rico, the Philippines, and Guam, while Cuba became independent but subject to American influence. This political cartoon from shortly before the conclusion of the war in 1898 reflects the pro-expansionist view, contrasting the benefits derived from American involvement by Puerto Rico (in a shiny new outfit marked "Annexation Suit from Your Uncle Sam") and Cuba (clutching bread and waving the flag of independence), with the uncertain status of the Philippines, depicted as mired in a primitive, "savage" condition. 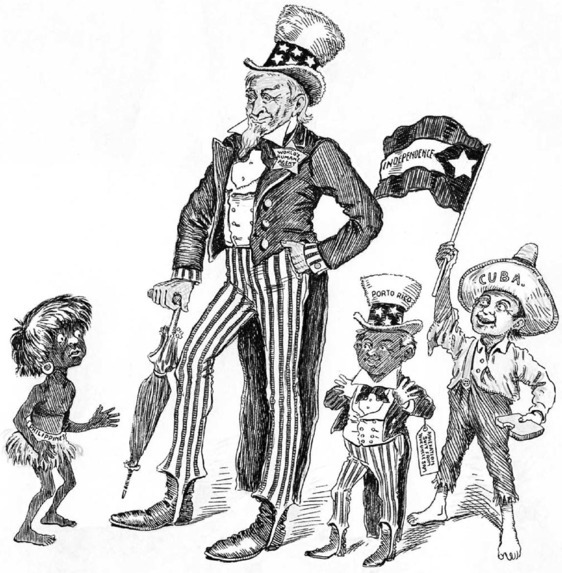 Typically, all three nations are depicted as children, dependent on a kindly and benevolent Uncle Sam. Something Lacking. Uncle Sam: "Well, Sonny, What Is It?" Philippines: "Where Do I Come In On This?" Source | "Something Lacking," 30 July 1898, from John J. Johnson, Latin America in Caricature (Austin: University of Texas Press, 1993). Cite This document | Unknown, “Uncle Sam Finds "Something Lacking" In New Possessions,” HERB: Resources for Teachers, accessed April 23, 2019, https://herb.ashp.cuny.edu/items/show/647.